Nikon today launched an Android powered photo frame which lets you view pictures in high-quality 3D without the need to wear 3D glasses! The photo frame called “My Picturetown 3D NF-300i” is powered by Android and has some added features such as a digital calendar, clock and weather display. Its 7.2 inch lenticular display with a horizontal double-density pixel system built into the LCD panel which enables stereoscopic viewing. Nikon says its photo frame offers bright and high-quality images. 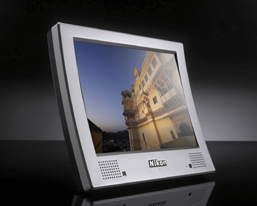 The NF300i photo frame stores up to 4GB of data and also supports a photo cloud service where users can upload their photos and convert them to 3D via Nikon’s online software. The service also allows viewing and sharing of 3D content. The My Picturetown 3D service is set to launch in early December in Japan. Previous This Motorcycle Transforms on the Go!